Got (questions about) milk? I've got you covered. Here, three real-life dairy queens (female farmers) set the record straight on the state of the industry, labels they wish would disappear, and how the moo juice fuels their fitness endeavors. Scoop yourself a bowl of ice cream and celebrate National Dairy Month, here. As a dietitian, I hear many, many misconceptions about dairy. My take? If it doesn't come from a lactating animal, please don't call it milk. Moreover, it's a nutritious staple in both mine and my clients' meals. Aside from boasting an impressive nutritional profile and affordability, dairy provides creamy joy that just can't be matched by substitutes. Sorry not sorry! Earlier this year I had the chance to meet three fellow contributors to the F.A.R.M. newsletter who all happen to be dairy farmers AND fitness professionals. We found ourselves talking late into the night about everything from labeling to feed costs - over ice cream sundaes, naturally. Courtney Newhall-Caballero, 28, lives in Phoenix, Arizona. Her family's dairy, Caballero Dairy Farms, was founded by her grandfather and great-grandfather in 1958. Born and raised in the industry, dairy has played a vital role in her life. Melissa Downerd, 26, grew up on a dairy in Central Ohio. Britney Zondlak is a dairy farmer in West Michigan. Though not born into farming, she considers herself fortunate to have found her passion early in life and has been working on the same dairy farm for more than fifteen years - since she was just 12! What do you LOVE about being a dairy farmer? Purple hair don't care: personal trainer, competitive bodybuilder, and dairy farmer Courtney Newhall-Caballero. I can recall the hours spent with my grandfather, uncles and cousins on the dairy. The cold mornings, the triple digit days, even the middle of the night calls to help with a difficult labor. Dairy farming isn’t about making money but the family. I don’t mean my blood relatives, I mean the cows. There is this love that fills my heart when you save a calve's life or watch a cow run across the pen kicking up her heals in joy when she hears the feed truck coming. I love dairy farming because of the love of the animal. They all have a place in the family and to create such a happy, healthy, thriving environment is so gratifying. I imagine it would be the way a parent feels when they take a step back to realize they created a happy warm home with a little family that’s all theirs. Nothing gets me more excited than watching a baby calf grow right in front of me, knowing that every single bovine has its own personality and they KNOW who you are and can sense how you are feeling. I love being an advocate for the dairy community to inform consumers what is in their milk….And the answer is…. MILK! Reassure them that those cows are being taken care of in the best way possible. We always invite people to our farm so they are able to see first hand how we care for our animals and get a feel for the work goes into raising livestock. the life cycle of a farm. always seems to be a common understanding among owners. Unlike in other industries, we are not each other's competition. We are each other’s peers and support system; we all experience the same struggles and know how hard it can be to get through them. Being a part of that community is indescribable. What's the biggest challenge facing the industry? Milk prices. It costs a lot to feed cows that produce the milk we drink, and so many people don't understand. Melissa Downerd of Burns Farms, which produces both beef and dairy. One of the biggest challenges facing the industry right now is the ability for farmers to effectively educate consumers on what truly happens at the farm level. I see so many theories regarding animal welfare, antibiotic use, use of GMO’s, processing of milk, etc. that simply aren’t true. However, to a consumer that has no concept of what happens on a farm, these theories seem plausible and thus become accepted by the general population. Now more than ever, it’s so important that we, as farmers, maintain an open conversation with our consumers. Likewise, I think it’s important that consumers are both open and willing to become educated on those matters. A huge challenge we are facing is that vegan is (perceived as) the way to go. With Netflix documentaries such as “What The Health” spreading false information regarding animal products it is hurting our truth. We live in a society where people are taking advantage of the lack of agriculture knowledge to make money. To sway a population into believing in something based on fake information. Following that documentary many people chose to go vegan. It took one documentary full of misinformation to sway a large group of people. This in turn is making it more and more difficult for us to have our voices heard. We spent too many years believing that people knew better that now we are struggling to have people listen. So now we face an uphill battle to educate society not only on how we raise, what we feed/why, but also the nutritional benefits to consuming the right amounts of dairy products. This in turn hits the livelihoods of the hardworking families who have spent generation after generation caring for these animals that support their families. Misconception about dairy you'd like to set straight? Dairy makes you fat. NO it doesn't! Also, ALL milk is antibiotic free! Every single time a farmer's milk gets picked up, it is tested to protect the health and safety of the consumer. And...almond milk? Can you milk an almond? NO ANTIBIOTICS OR HORMONES EVER! Hormones are naturally found in everything we consume - plants being the highest in naturally-occurring hormones! We do not feed hormones to our dairy cattle. They receive a TMR (Total Mixed Ration) created by a nutritionist for a balanced diet to help them reach their potential and best health. There are no antibiotics in milk, either. Any animals treated are separated from the herd, milked separately to ensure theirs is not mixed with the milk for pick up, held until their withdrawal date of that treatment, and their milk is tested to ensure their bodies are cleared of all medicine before returning to the herd. Tankers are also tested multiple times before being unloaded at the plant. If a tank is ever tested positive, it is dumped immediately and that dairyman could potentially be shut down for good. There is zero tolerance policy for any antibiotic residue in milk. Therefor, milk is ALWAYS antibiotic free regardless of what milk you choose to buy at the store. Britney Zondlak, aka Ms. Fit Farmer! ALL milk (whether it is organic or not) is antibiotic-free. ALL milk (whether it is organic or not) contains hormones. And before you mention almond or any other plant-based milk product, yes, they too contain hormones. Plants are living organisms after all! I think "hormones" is one of those words that people don't truly understand. At first mention it sounds bad, and it's assumed it's bad FOR you. Marketers do a great job of playing to this fear and that's why they're able to charge more for products with a "no hormones added" label. Rest assured your milk supply is safe! Farmers have a lot at stake and can't afford the risk of selling anything less than quality milk to our processors. If you could wave a magic wand and make one label disappear from dairy products, what would it be? Antibiotic free, organic, grass fed. No hormones added. As I mentioned before, there are no hormones added. This is the perfect example of people taking advantage of society's lack of agricultural knowledge to make more money. No added hormones - for the reasons stated above. I'd also like to be able to erase those "natural" labels found on many plant-based milk alternatives. These products are processed. Many times, to reach a similar nutrition profile as real milk, milk alternatives are fortified, meaning nutrients are added that are not naturally present. Farm fresh, real dairy milk is naturally nutrient-rich and contains only three ingredients - milk, Vitamin A, and Vitamin D. Plant-based milk alternatives just don't compare. You're all professional trainers and competitors. How does dairy fuel your fitness endeavors? The real question is how doesn't it?! Dairy is incorporated into at least three out of my five meals a day. Nothing beats a cold glass of chocolate milk after a long workout - nine essential vitamins - you can't beat that! I rely on milk to keep me fueled whether I'm working on the farm or training in the gym. That's because calorie for calorie, whole milk is nutritious and contains a little bit of nearly every nutrient we need to function. Not to mention, dairy is quite literally superfood for our bones! The great majority of evidence shows that dairy actually improves bone density, reduces osteoporosis, and lowers the risk of bone fractures in elderly adults. What's not to love? Dairy is a staple in my diet. Why? Because it is so dense in necessary nutrients to not only build but to repair and keep my body healthy in the long run. One, for women, being calcium. I have tracked my micronutrients without dairy in my diet and it is extremely unfortunate how much calcium I lack on those days. 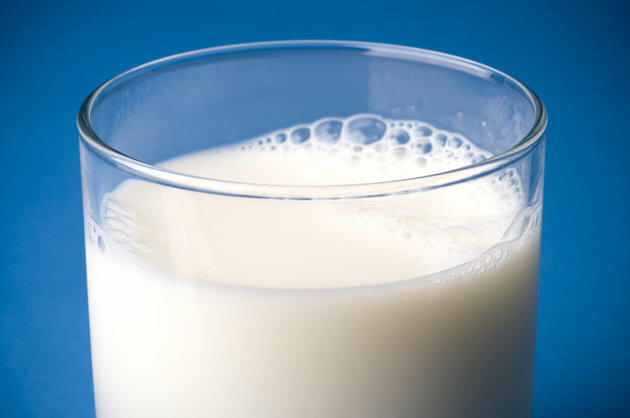 With dairy, I ensure that I receive adequate calcium to keep bones healthy and strong. Having the opportunity to grow up on milk allowed me to always have strong bones and overall great health. No broken bones ever for this proud dairy consuming 28 year old! Thirsty for more? Visit here for more dairy myth-busting. Enjoy your dairy. Enjoy your life!